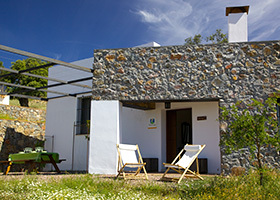 Work and effort of a family focused on preserving the activity and vitality of a unique spot in the hill town of Higuera de la Sierra, the rural houses “El Rincón de las Tobas ” settle on a particular farm with six hectares to 1.5 km from the centre of the village. 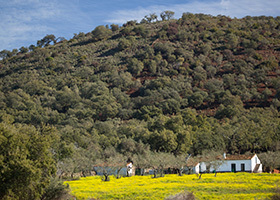 The smell of the rosemary, rockroses and oaks discover visitors a short trail of majestic cork oaks, drawing the path between Higuera de la Sierra with Zufre. Along the way we meet old drinking bowls for cattle, along with Iberian pigs with “denomination of origin” and numerous farms that accompany the landscape to our final destination, the estate Las Tobas. Name given for being next to a beautiful vertical formation of sedimentary rock “toba”. In a setting of incomparable beauty and from windows and portal of the holiday rural houses, the visitors can enjoy unique views to the Natural Park Sierra de Aracena and Picos de Aroche. The contact with nature in a unique landscape frame unify comfort, tranquility and beauty with a great number of activities that can be performed in the environment: hiking, horse-riding, culinary, ornithological… offer travelers many options for relaxation and outdoor activities. The three houses that make up “El Rincón de las Tobas” are house “PICO – PICAPINO”, house “VERDECILLO” and house “ARRENDAJO”, name of three species of birds that inhabit in the mountain range. Each of them has 103 m2 constructed from which to admire the majestic oaks and the landscape that stretches under them. Three dwellings with similar characteristics, situated between pastures of holm oaks and cork oaks to two kilometers from the town of Higuera de la Sierra (Huelva). They are spacious and comfortable, and have all needed services to make your stay most enjoyable. In the Natural Park Sierra de Aracena and Picos de Aroche, declared biosphere reserve by Unesco, with a rich diversity of flora and fauna. It has an extensive network of trails for sports in contact with nature in a unique natural environment. We are in Higuera de la Sierra, Andalusian village of whitewashed streets, where you can enjoy its countrymen, festivities and traditions. 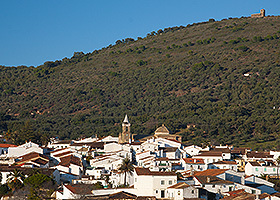 Higuera is declared ‘eco town’ and is known for enjoying every January 5th, the second oldest Christmas parade of Spain.